With limited editions, my focus is on evaluating the aesthetics of the look and less on evaluating the internals. 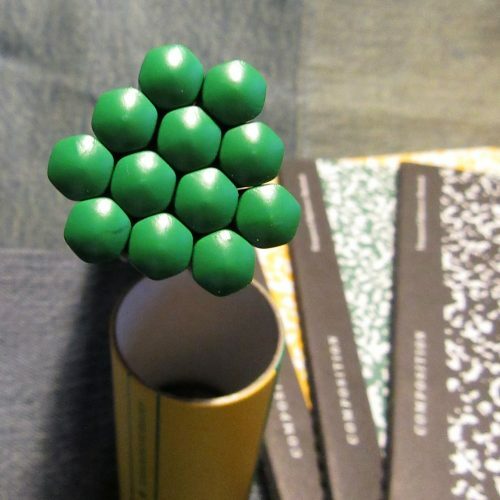 Viarco makes Baron Fig pencils. I’m not a huge fan of Viarco pencils, I find them to be a tad on the scratchy and gritty side for my taste. Which is BAFFLING because Viarco is capable of creating the smoothest and prettiest graphite as they do with some of their art graphite. Their Art Graph Sticks are creamy smooth brilliance. They are capable of SO much more. As much as I love the look of the Prismatics, the No.2 hits me in the feels. 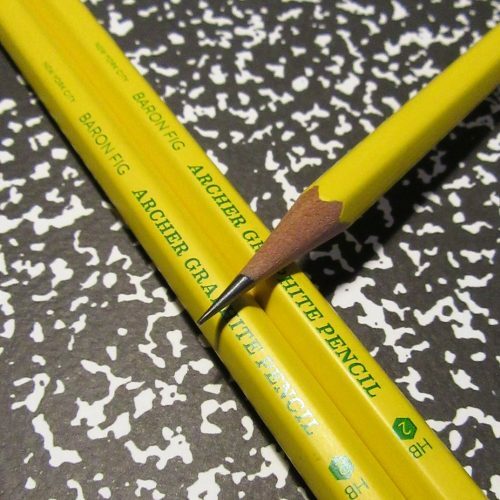 There is so much to love about this pencil. 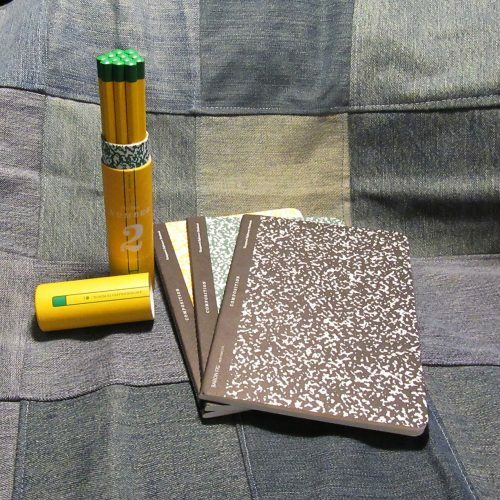 Part of what I love is that pencil nerds have been asking any of the makers of limited edition pencils to do something with a classic yellow school pencil. No one has delivered until now. Baron Fig not only nailed it, they hit it out of the park. 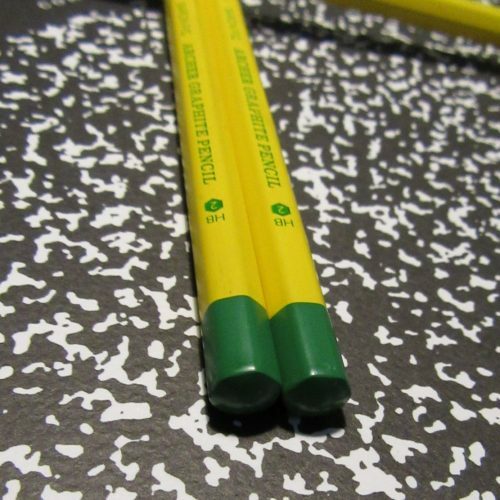 This pencil is steeped in American school pencil tradition. They went with a matte but bright finish. The yellow is bright or light chrome yellow versus the mid or dark chrome yellow we usually see on school buses and school pencil. It’s cheerful and put a smile on my face. The green end dip and imprint are light chrome green. It’s also super bright. The color combination is classic. It calls out to Dixon’s Ticonderoga, General’s Badger or their Semi-Hex, and John Deere tractors. * the change in colors for pencils- the Ticonderoga uses foil in its imprint and a dusty shade of green on the ferrule. While the Badger sports green foil and a gold ferrule. IN contrast the No.2 has no ferrule at all, just a simple green end dip that perfectly matches the imprint. Unlike the budget pencils this has a thick application of the matte lacquer. Inside the matte lacquer is, for the first time, good old cedar. 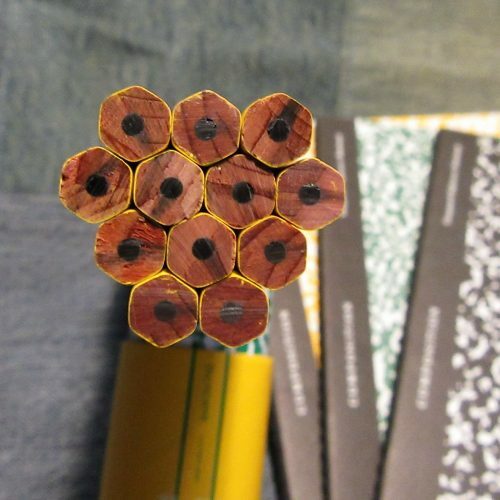 The core on mine were mostly centered, though I had 2 pencils that were pretty off center in my dozen. I tested the No.2 out on a variety of paper from Baron Fig’s Vanguard and Confidant, to Write, to Field Notes, To No Brand Notebooks, and finally P+G index cards. The results were surprising. The 3 that I tested and used extensively for several days were much less gritty than the previous Archers I’ve used. As usual the archer’s perform best on Baron Fig’s own paper, the smooth yet toothy paper is optimum for gaining the darkest line with the least amount of effort. 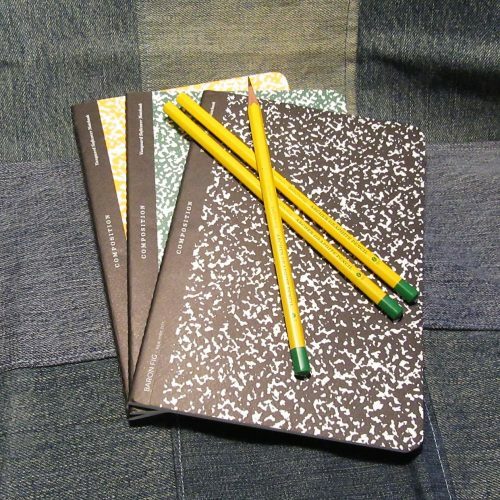 While smoother paper like the Write pocket notebooks forces the user to use much more pressure to get a good dark line. This entry was posted in Review and tagged baron fig, new school, No.2, old school on 20171019 by leslie. Back in the mid-80s Mead’s Trapper Keeper went insane with school kids. I was no exception. I had one of the “fashion” versions with a geometric pattern that reminded me of a prism. I think I had an earlier version with kittens, but I’m not sure. 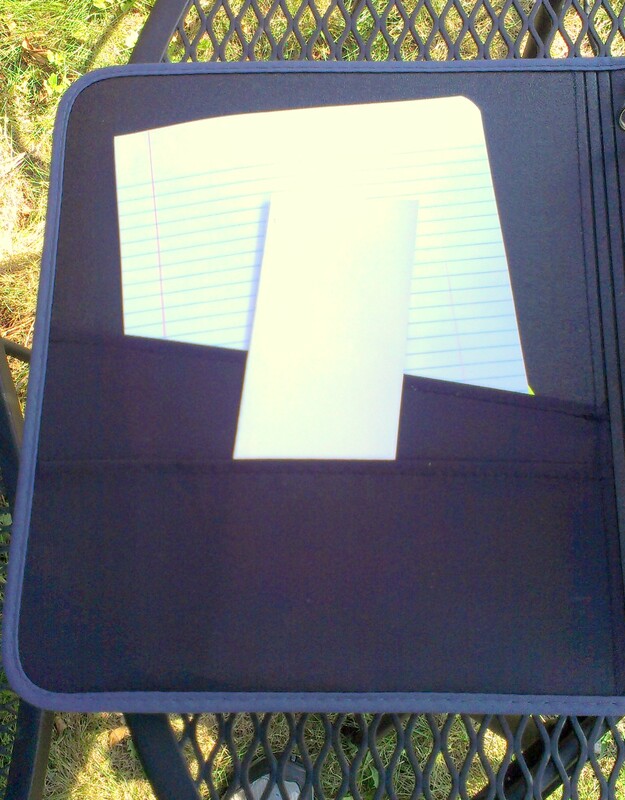 I know that the velcro soon failed on me and the plastic sliding “trapper” 3-ring binder soon gave up on me and I switched to a heavy duty canvas 3-inch 3-ring binder with a clipboard in the front. At some point in high school I switched over to a zippered 5-star binder to hold all my junk. Why? It was black. Anyway, here I am twenty some odd years later in graduate school after a 15 year hiatus from school and needing something to keep my printed articles, notebooks, syllabi, and class handouts in one place. Up until today I’ve been using a half inch 3-ring binder to corral the syllabi into one place, a poly envelope to keep the print outs together, and pockets in my notebooks to keep class hand outs in the notebooks. It was less a system and more of a stop gap measure to keep my stuff somewhat together, or not lost. 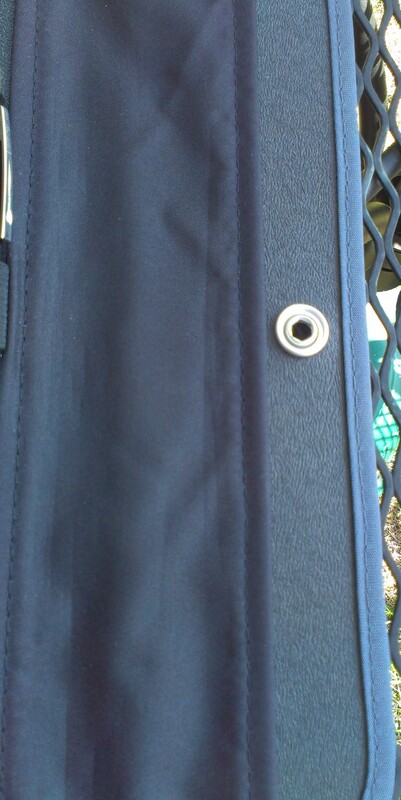 The binder wouldn’t fit into the poly pocket and the button that help the pocket closed soon popped off as I slid it in and out of my back pack. Honestly, at one point I was looking for something a little better than my plastic 3-ring binder and more like my old canvas binder but a little like a Trapper Keeper. 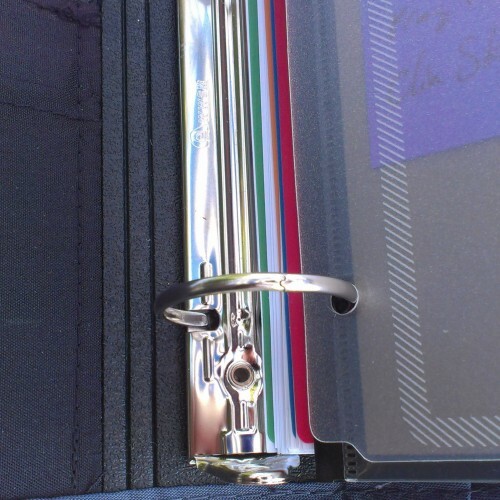 Decently sized 3-ring binders are crazy expensive at Staples and generally fall apart after some hard use. I read this review that Trapper Keeper was back. Mead was introducing the TK after a hiatus. Currently they seem to only have the standard colors with a dotted fade printed on them and the stitched version available in 5 colors. The stitched version is a plastic covered with fabric, the edges are covered the whole thing is stitched up. The TK is held closed with a sturdy snap. The front features a clear pocket that you can slip paper into and customize the cover with your own art. The pocket will only hold a few sheets of paper, so it really is made to only hold a decorative sheet. It does not arrive with anything in the pocket but a label. The interior 3-ring binder is shiny chrome plated steel and very sturdy. The regular “fade” version arrives empty, while the stitched version arrives with 5 plastic dividers. Each a different color. These dividers are regular 3-hole punched and do not feature the slotting of the “Trapper Snapper” system. 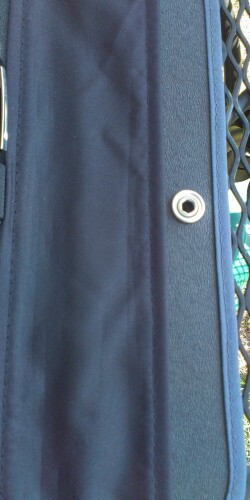 Inside the binder are 2 stretchy fabric pockets that will accommodate a composition notebook or a stack of paper. The corners of the pockets are not reinforced, so this is where the TK will fail. It’s likely I won’t keep anything in these pockets but a few odd handouts from my classes that will eventually be punched and put into the binder. The back cover no longer sports the clip that turned the back of your Trapper into a clip board. I’m seriously missing this as it was something I used ALL THE TIME in my original Trapper until I graduated to a real clip board. IF I can give Mead any feedback it’s to bring back the clip in the back. I’m not sure this particular TK is stiff enough to use as a clipboard, but it would do in a pinch. Though there is no clip they have kept the pen loop, though in this version it is made of elastic instead of plastic. it’s too loose for a pencil, but would hold a bullet pencil nicely. I picked out the green Trapper and mine is a nice shade of olive. the contrasting gray is really nice. I assumed it was black from the photos on Amazon but it’s not. The interior of the Trapper is black. The logo and other accents are all white. The stitched Customizable Trapper Keeper is not a light weight item, I was surprised once it was loaded up how heavy it is. But the majority of weight comes from all the paper I loaded into it. It’s much more compact than my previous pocket, mini binder, and assorted hodge podge of junk. The velcro closures are gone. Good riddance, mine always tore off the flap leaving me with a trapper, but not keeper. In the velcro’s place is a sturdy steel snap. Unlike the adjustable nature of the velcro the snap has but one position. It can’t be tightened around your goods. This makes the TK kind of loose and sloppy. Understandably adding additional snaps or buttons would add a lot of cost and still not make the cover tighter on all loads, I just wish there was a way to adjust it. 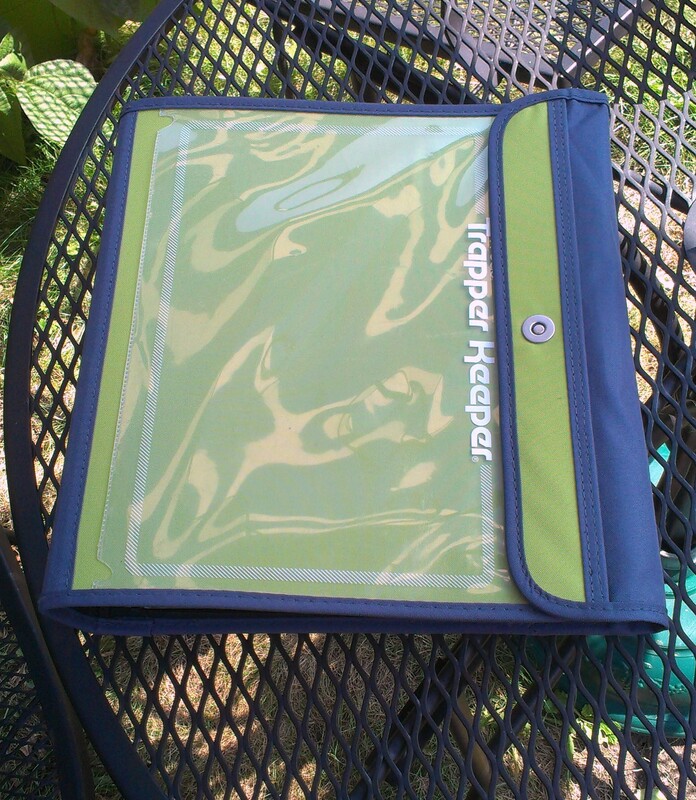 Along with my Trapper Keeper I also ordered a Trapper Folder with customizable cover. 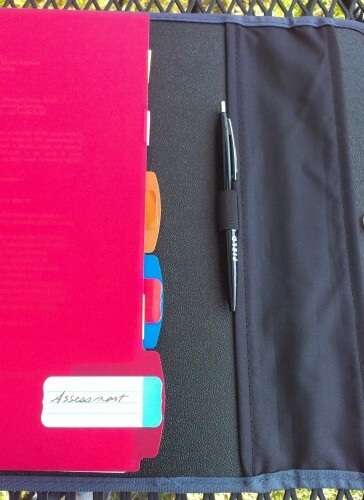 Basically it’s a plastic (poly) folder with 2 interior pockets and a clear pocket on the front cover. These hold a surprising number of printed off articles with ease. Right now I’ve got about 100 pages of articles shoved in there and the thing looks great. Ultimately I’d like to order one of these poly folders for each of my 3 classes so that the load is spread out. 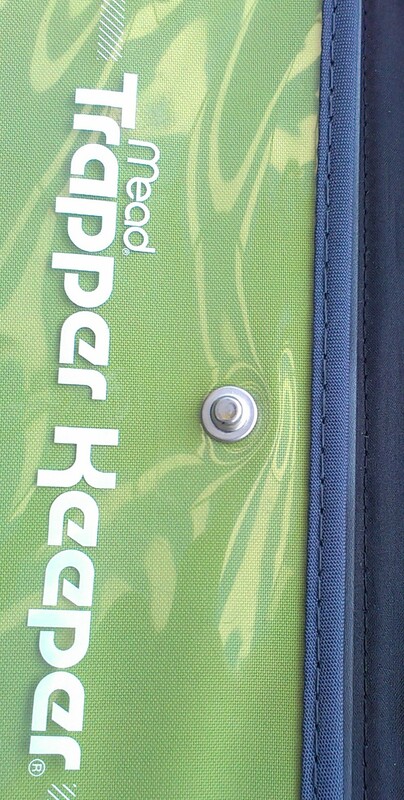 These folders do not feature the Trapper Snapper easy removal tool. To get these babies out you have to open the 3-ring binder. The plastic dividers are plain with no printed graphics. There are tabs spaced out along the edges. There are 5 colors, coordinating with the available TK colors. Most of the colors are semi translucent. The plastic is pretty flexible but stiff enough that you can use the dividers to move through the binder easily. Overall, I really like the new Trapper Keeper. I wish it had a few of the old amenities (clip, bring it back) but overall it’s a very nice binder that will hold all of my stuff and help to keep me organized. This entry was posted in Review and tagged customizable, fabric, keeper, mead, old school, old skool, school, stitched, trapper, trapper keeper on 20140917 by leslie.